WatchThru is an interactive method for extending wrist-worn displays on commercially available smartwatches. To address the limited visual and interaction space, WatchThru expands the device into 3D through a transparent display. This enables three novel interactions that leverage and extend smartwatch glanceability: Pop-up Visuals, Second Perspective, and Peek-through. 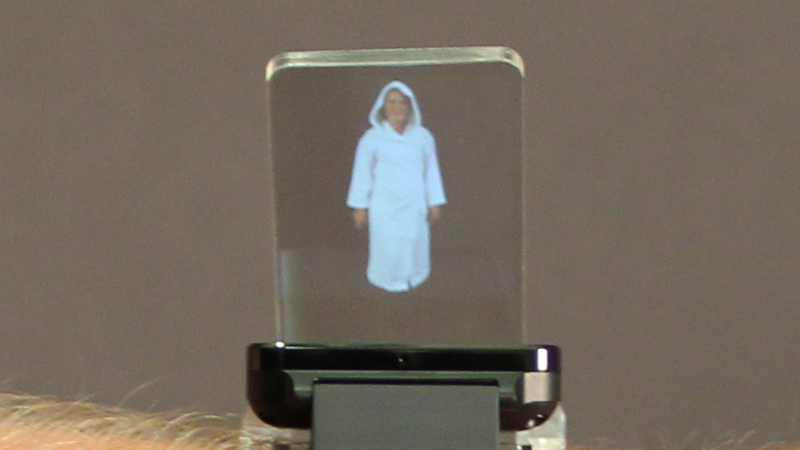 In contrast to most AR displays, this device does not obstruct the user's face, nor does it require the user to hold it (like a smartphone). It therefore has interesting potential as a wearable, unobtrusive, and always-accessible wrist-worn AR device. Wenig, D., Schöning, J., Olwal, A., Oben, M., and Malaka, R. WatchThru: Expanding smartwatch displays with mid-air visuals and wrist-worn augmented reality. Proc. of the International Conference on Human Factors in Computing Systems. 2017. WatchThru extends smartwatch displays into 3D space, enabling novel AR interactions.